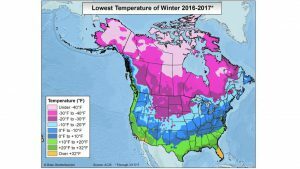 The WunderBlog has posted a map showing the coldest temperatures each location in the United States felt this past winter, which includes December 2016 through February 2017. It’s probably important to point out that this year, the coldest temperatures actually occurred in March in some locations, when the frost last week occurred. But that’s a different season according to climatologists. Hopefully we won’t get that cold again this spring! 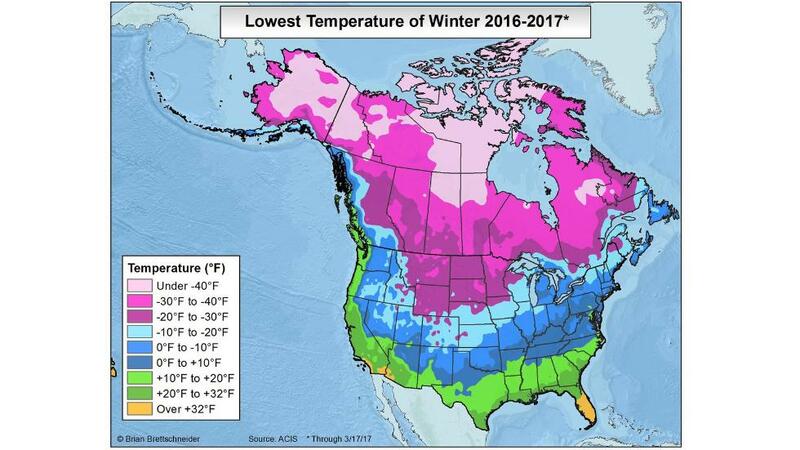 You can read about it at https://www.wunderground.com/news/coldest-temperatures-winter-2016-2017-wrcc?__prclt=KJJOO5Op. Next: How did NOAA’s winter forecast compare to the observations?